مشکل آلودگی هوا در چین به یک بحران تبدیل شده بنحوی که مقامات به این نتیجه رسیده اند که بارش های مصنوعی به عنوان راه حلی برای این موضوع خواهد بود. این موضوع توسط وانگ جینان Wang Jinnan (معاون دانشگاه چینی برنامه ریزی محیط زیست) در چهارمین گردهمایی احلاس Caixin که در پکن برگزار شد عنوان گردیده است. While the extraordinary growth of the Chinese economy has been the business success story of the past two decades, it has come with high environmental costs due to rampant pollution. Now the cost for cleaning up China’s notorious air pollution has been given a price tag - $290 billion, according to Chinese Academy for Environmental Planning deputy head Wang Jinnan. Wang presented his estimate at the 4th Caixin Summit in Beijing. But the staggering investment has an upside, as Wang reported that the investment would increase China’s GDP by nearly $315 billion and create over 2 million jobs. What is beyond argument is that China now has a significant air pollution problem across much of the country and especially over its major cities. Earlier this month the Ministry of Environmental Protection confirmed that 13 provinces suffered record-high levels of smog as in 2013 China endured its worst air pollution in 52 years. Beijing was shrouded in its worst haze in decades in January, when "beyond index" readings of airborne particles measuring 2.5 microns, or PM2.5, one of the worst pollutants, reached more than 20 times higher than levels deemed safe by the World Health Organization. In October, Heilongjiang's provincial capital Harbin was hit by smog so thick it could be seen from space. The mainland's notorious smog has spread from major urban centers Beijing, Shanghai and Guangzhou to inland cities in the country’s central, western and northern provinces. In early December, central and eastern China was blanketed by haze that affected Jiangsu, Zhejiang, Anhui and Henan provinces and Shanghai. Ominously, on 18-20 December, the Chinese media reported that several western cities including tourist hot spots Lhasa and Xian were shrouded in smog or dust and three cities in coastal Shandong province were also blanketed by smog, when pollution readings went off the scale. On 22 December thick gray smog enveloped the city of Shenyang in northeast China's Liaoning province with PM2.5 concentrations exceeding the maximum reading of 500 micrograms per cubic meter, causing municipal authorities to issue an air quality yellow alert. In September the Chinese government’s State Council issued its Action Plan on Prevention and Control of Air Pollution. 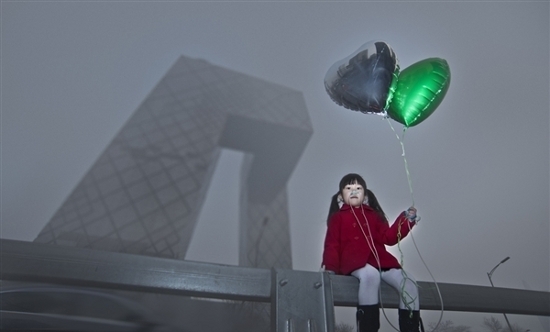 The Action Plan noted, “China’s air pollution is a long-standing problem. It is a herculean task to control air pollution. To serve the purpose, we must make persistent and strenuous effort, stay committed to the principle that everyone is responsible for air pollution control and the whole society should work together for the fresh air and strive for economic development in the course of environmental protection in order to achieve environmental, economic and social benefits.” The Action Plan pledged to reduce the level of airborne particulate matter in major cities by at least 10 percent by 2017. The crisis is forcing regional and municipal governments into finding solutions. Following Beijing’s lead, its major port outlet to the east, the city of Tianjin with more than 14 million inhabitants, saw its municipal government announce on 15 December that the city would impose an annual quota on its new car license plates, requiring residents to obtain a plate either through auction bidding or lotteries. Each year the city will issue a total of 100,000 car license plates for private vehicles. According to the management plan, 60,000 plates will be issued via lottery, including 10,000 for fuel-efficient cars and 50,000 for conventional cars. The remaining 40,000 plates for conventional cars will be auctioned. Therefore, the cruel dilemma facing the Chinese government is whether in its drive to curb air pollution it is willing to imperil electrical output to industry and citizens, as the $290 billion price tag is higher than the 2012 gross domestic products of most countries, including Finland, Israel and Portugal. China’s air pollution problems have been decades in the making, and will not be solved overnight, though they will perhaps ameliorate 10 percent in major urban areas by 2017.